Ash Sullivan, Eric. Sticky and Slimy. L. 2007. This nonfiction book tells all about animals (and a plant) that are sticky (sundews, spiders, geckos, squid) and slimy (hagfish and squid). 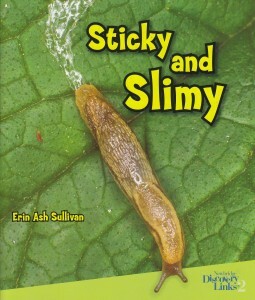 It explains in what way they’re sticky or slimy, how this adaptation works, and why it’s useful for them to have! This is an entertaining nonfiction book about weird animals that will easily keep readers around L interested. Chomp! A Book About Sharks. L.
Berger, Melvin. Chomp! A Book About Sharks. L. 1999. This book tells all about different shark species, a shark’s life-cycle, how sharks feed, and how sharks swim and live. Popular above (and even below) its difficulty level, due to the great cover, exciting subject matter and cool photos of sharks. Most of the vocabulary is straightforward and non-technical, so this can be a good introduction to more complex non-fiction writing as well. Officer Buckle and Gloria. L.
INFO: Rathman, Peggy. Officer Buckle and Gloria. L. 1995. DESC: Nobody pays attention to Officer Buckle’s safety speeches until his new police dog, Gloria, starts acting out his tips when he can’t see—until he finds out and thinks she’s stolen the spotlight. Kids like picking out the funny details in the drawings. Caldecott winner! A Dog’s Best Friend. L.
INFO: Thompson, Gary. A Dog’s Best Friend. L. 1998. DESC: A somewhat disturbing choice for a level L, A Dog’s Best Friend chronicles the life of “Niles,” a very spoiled and downright mean Schnauzer, as a new dog (a much less fancy basset hound, at that) moves into his owner’s ritzy condominum. The vindictive elements of Niles’ personality are a bit much; but some kids might get a kick out of discussing Niles’ personality, and the nasty trick he plays on newcomer (the unfortunately-named Crumbley). Eventually, the book turns around: Niles and Crumbley start to become friends, and Niles accepts that Crumbley, even though he’s not as polished or fancy as Niles himself, might not be so dumb after all. Leo the Late Bloomer. L.
INFO: Kraus, Robert. Leo the Late Bloomer. L. 1971. DESC: Leo follows the adventures of the family of Leo, a “late blooming” young tiger who just can’t seem to do anything right. He can’t draw, write, speak, eat neatly, or take care of himself – which really seems to bother his older brother (our narrator), and, especially, his father, who basically spies on him throughout the book, in search of evidence of Leo’s “blooming.” Eventually, at the end, Leo does “bloom.” This book, because of its vague and esoteric plotline, seemed to leave most kiddos very confused, even if they could handle the very simple language. The notion of “late bloomers,” I think, is just culturally outmoded these days. It also doesn’t help that the book is illustrated in fairly terrifying Henri Rousseau-style watercolors, throughout. Not recommended for use with our students, unless someone refuses to read about anything but tigers!